Unless you have been living under a rock, you could not have missed the craze around Descendants of the Sun. An avid Kdrama viewer sees this happening almost every year. Boys Over Flowers, You Who came from the Stars were 2 of the dramas that comes to mind. This year DOTS has taken over the K-Drama wave and have sky rocketed our two stars into crazy stardom. So much that DOTS has a sequel coming out and a movie? Though no concrete news has been said about the sequel and movie, we do know that the DOTS season 2 will premiere in 2017. 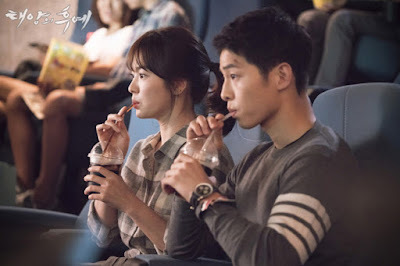 But while we wait for the sequel and movie news, lets look back at the most interesting scenes in Descendants of the sun and in the process stare at Song Joong Ki. What I like about this scene is the Captain Yoo Shi Jin's clear surprise when Kang Mo Yeong totally ignored him and followed by a fake cry for help. So Kang Mo Yeong got stood up but I totally adored the interaction between the two before he got the call. It has a realism where two people who are attracted to each other are flirting and finding the other cute. So Yoo Shi Jin may be a charmer in the whole series but he is totally a player. No one can do this scene better than Song Joong Ki. He just wanted her in his arms. 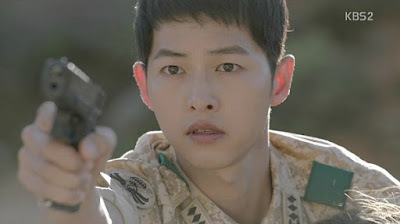 Yoo Shi Jin rarely shows his true affections other than light flirtations. His slight glances and smiles makes your heart flutter but this solidified how much he truly loves her. While he knows the consequence of disobeying orders, he still stands firm and wants to go ahead and protect her. And also the look of determination has never looked sexier. Well, this list is not complete without a kiss scene. Though the scene may lack the passion of a Song Joong Ki kiss, it does not lack in sweetness and squeal power! Incase why you are wondering that this hold higher role than their Truck kiss, it was mainly cause I found it satisfying to note that he could not resist her one bit. It is difficult to choose only 5 from a series of amazing scene but these moments were the ones that brought our amazing skills of their acting as well as made their characters a lot more likable. Not to mention that it show an what the character's inner most feelings were at the moment which made their relationships stronger with each other. Let me know which were your favorite 5 scenes from DOTS in the comments below.